Peas are one of the first crops planted and harvested in New York. Fresh market, edible pod and processing peas are all produced. In fact, the state has a long history of processed pea production with a 10-year average of 17,689 acres grown. Processed peas are grown in fields ranging in size from 20 to 100 acres. Processors select the varieties to ensure consistent supply to the plants. The peas are machine harvested and shelled right in the field and taken to the plant for sorting, cleaning, freezing and packaging. 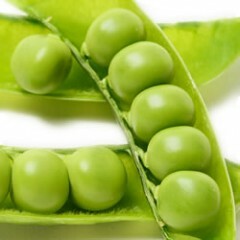 Fresh edible pod peas or podded peas which are shelled by the consumer are a delight in early season markets. These markets are more concerned with blemishes on the pods. Peas are very sensitive to excess soil moisture and are susceptible to numerous soil pathogens. Weeds can quickly out-compete peas and are a special problem in late-April and May plantings when temperatures are favorable to annual weed seed germination. Cornell Cooperative Extension Educators and Cornell faculty work together annually to conduct research on many aspects of pea production in the state. Below you will find educational information and results of our research trials.